As I enter the third week of #cook90, I'm acutely aware that I'm definitely cooking more than I usually would. Truth be told, when I began this adventure at the beginning of the month, I kind of figured it would be a piece of cake for me. Since I work from home, and cook for a living, I figured I usually cook just about all the food we eat anyway. Although I hadn't been cooking for my family quite as much over the last couple of crazy-busy months, my normal routine is to cook breakfast, lunch and dinner everyday. So I should be able to handle this. Easy. But I'm realizing that, while I probably do cook most of our meals, I actually don't normally cook them all. I would guess we normally eat dinner out or order in at least once a week. And on top of that, my kids probably have school lunch at least once a week (if not more). And we run to the bagel place for Saturday morning breakfast, or grab something while we're out running errands, on a pretty regular basis. So, I don't normally cook quite as much for us as I think I do. And this #cook90 thing actually is a challenge. So far, I've used 2 passes. That's 2 times this month that I didn't cook a meal for anyone. But there have been many other times that I've cooked for one or two of us, but not all of us. Or I've reluctantly cooked just for me while everyone else went out for bagels (last weekend). Or I've reheated leftovers for my kids while my husband and I go out for dinner on date night (technically counts as cooking, since I originally cooked the leftovers, but still. Not exactly the same as really cooking dinner). So at this point, we're just beginning Week 3 and honestly, I'm getting a little burned out. I'm still in it to win it, baby! I'm not in the kind of gal who takes on a challenge and quits halfway through. We WILL conquer this, my friend! You still with me? Great! Sign up to #cook90 with me! You'll get special emails from me with recipes and ideas for you, and updates from my #cook90 adventure. Today is MLK day. I wish I could say I had some grand cooking plans in mind to honor the Nobel prize-winning civil rights icon, but no. My best idea was French toast. We hadn't had it in a long time, so I thought a day off from school would be a great day for me to treat my kids with one of their faves. But when I swung by my bakery in the early morning for brioche, they were out. They had sourdough, and ancient grain, but neither of those really says TREAT like brioche. So, no French toast. I bought 2 baguettes instead. For breakfast, I sliced one, toasted the slices, brushed them with olive oil and melted some aged cheddar over them. I topped each with a couple baby spinach leaves, some thinly sliced red onion and a fried egg. I used the leftover tostada shells from Saturday. 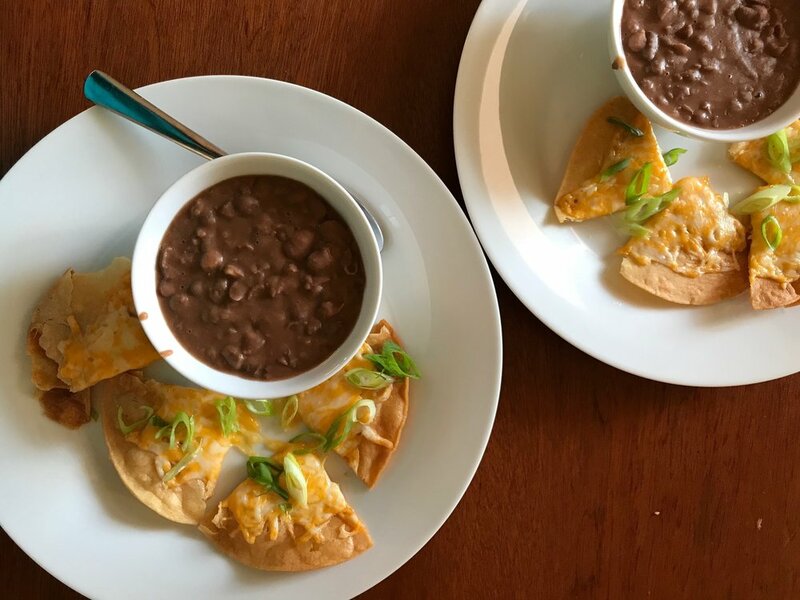 Instead of making full-on tostadas with them, I melted shredded colby-jack cheese over them, broke them into pieces, and served them with a bowl of pinto beans. A little salsa and a few scallions for finishing touches. I bought 6 (!) ribeye steaks on sale at Whole Foods awhile back, then stuck them in the freezer until I would have a chance to cook them. I took that chance tonight: ribeye steaks seasoned with salt, pepper and ground garlic. 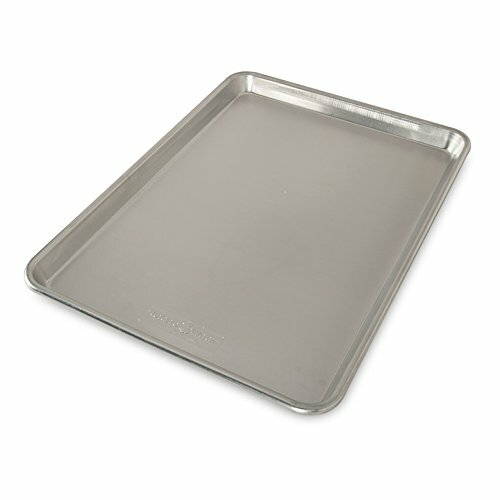 I roasted them on an oiled sheet pan with rounds of yellow onion thrown onto the pan toward the end of cooking. Served the steaks with baked potatoes and spinach sauteed with onions, garlic and crushed red pepper. We ate almost 3 of the steaks for dinner (they were each really big), and just a little of the onion. So we have the other 3 steaks and those grilled onions to use for other things in the week ahead. Leftover Mexican-style beans with leftover tostada shells topped with melted cheese and scallions. A dollop of salsa is great either in the beans or on the tostada pieces (or both!). Cooked twice as many steaks as needed, and some grilled onions, to use for other things later in the week. Kids were off for a second day. Breakfast was simple: eggs, toast and fruit. Then we went out to see a movie! This was one of those days when we totally would have had lunch out on any normal day. The movie was at 11:10am, and I had a meeting at 1:45pm, so hot dogs at the movie theater might have constituted lunch on any normal day. But alas, #cook90. So we came home and made steak-and-bleu-cheese sandwiches (with yesterday"s leftover steak). My daughter helped me, which was really fun! (And - I had to push my meeting back to 2pm). BUT - they were sooo good! The kids thought the bleu cheese was too much with the steak, but this is one of those instances in which they are just clearly WRONG. They were perfect. I tested the Beer-Simmered Beef and Gruyere Casserole one final time before writing it up for you. It's da BOMB. Also, it makes a lot. You should feel free to halve the recipe if you aren't feeding an army of large, hungry men (or don't have a large enough baking dish). It made about twice as much as we needed. But since this is the third time I made it in the last couple of weeks (because of testing), I might give the leftovers to a neighbor instead of eating them. We'll see. Back to school for the kids today. For my daughter: eggs, toast and fruit. My son (who gets up later) said, "please, not eggs again!" And if it weren't for #cook90, I would have said "fine, have a bowl of cereal!" But, #cook90. And eggs are quick, and I didn't have time to make anything else. Then I remembered we did have a little bit of those beans still left over in the fridge, and I had flour tortillas on hand. So I scrambled the eggs instead of frying them, heated the beans in the microwave, and wrapped the eggs and beans in a large tortilla with a little salsa to make a beakfast burrito. It was a HIT. Full teenage tummy off to school. Check. For the kids: steak sandwiches, without the bleu cheese this time (although they're still wrong about that). Oatmeal (made with rolled oats) with just a tad bit of brown sugar and raisins and dried cranberries to put on top. My daughter begged me to let her take a frozen burrito to school for lunch. She is really getting tired of sandwiches. I relented. My husband has been bringing home Red's frozen burritos (ahem, hubby: #cook90! Hello!! ), which are actually really good. They're organic, with all ingredients that we recognize and would put in our own burritos if we had a little frozen burrito factory in the basement. So fine. She heated it up in the microwave herself and I had her add a couple mandarin oranges to her lunch box. My son had a turkey sandwich. I was short on time, so made quesadillas with shredded colby/jack cheese, Monday's leftover steak and grilled onions, and cilantro leaves. Put all the good stuff on half of a large flour tortilla (in Mexico they use corn tortillas, but we usually do this American-style). It's best to do it in this order: a little cheese, then whatever other fillings you're adding, then a little more cheese. That way you have cheese on top and bottom to hold the tortilla together. Put the quesadillas on a sheet pan and put them in a very hot oven (~500+ degrees) on the top rack. Watch them, and when things start to get melty and the tortillas are starting to brown (about 5 minutes), take the pan out, flip them over and slide it back in for another 5 minutes or so. We served them with salsa. A quick pic of our breakfast: fried eggs topped with shredded colby/jack cheese and salsa. Super yummy. Everyone (except, strangely, my daughter) was still tired of fried eggs (sorry, family!). 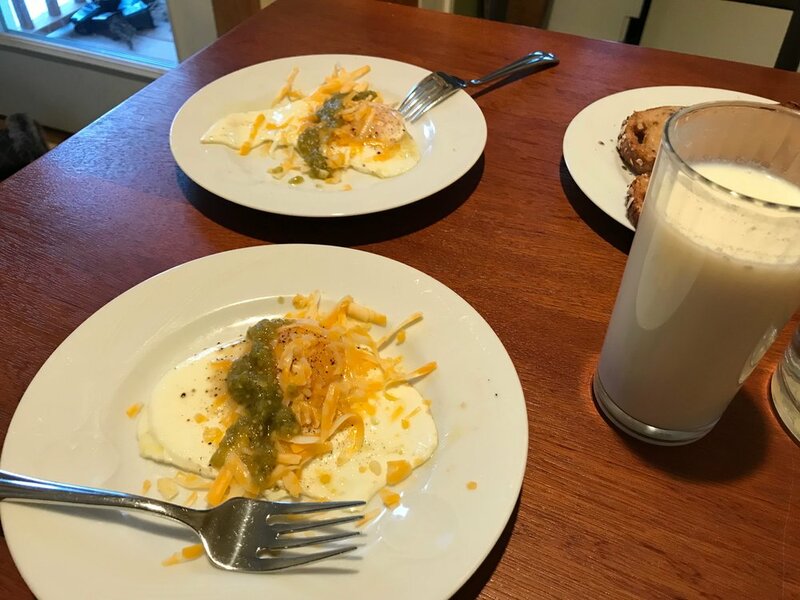 So after sending my daughter off to school with boring fried eggs, toast and fruit, I made eggs for the rest of us with a little shredded cheese and salsa on top. Really tasty. Big batch of this oatmeal before heading out for the day to the Women's March in NYC with my kids and another family. 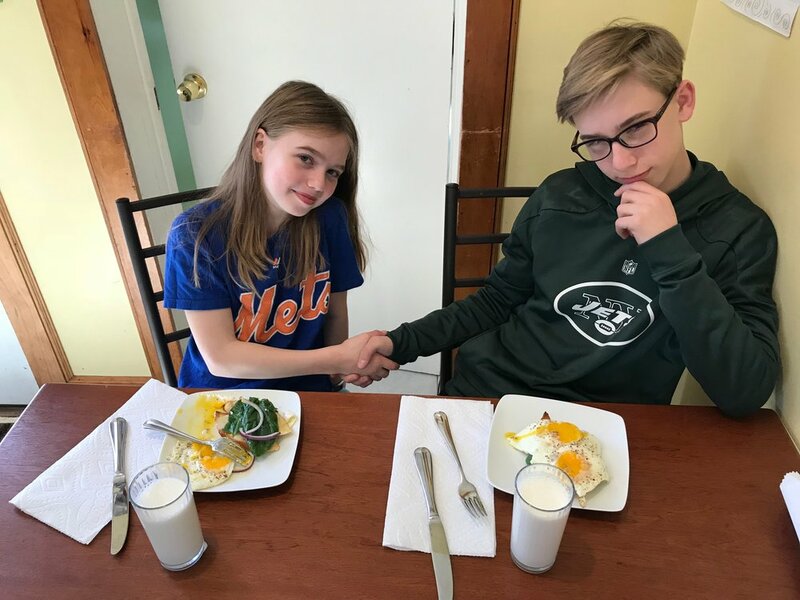 My daughter and I had plenty to eat until our late lunch, but my son wasn't quite listening when I explained how much he was really, really going to wish he had eaten a good breakfast because it would be quite a long, crowded, tiresome walking day before he could eat again. I used my final pass to have lunch with everyone else at a restaurant in the city after the march. FINAL PASS, people! It's only January 20. I'm slightly terrified. Back home after a really long day. Very tired. Kids were still full from lunch, so I just made myself a small salad. And then I went to bed. Another weird cooking situation: we had a meeting after church, at which they were serving lunch. So I, of course, brought my own, which I was quite sure would be a little awkward. But as it turned out, lunch was pizza and no one noticed that I didn't grab a slice (my son grabbed a couple). So I ended up just bringing my lunch back home to eat. Very simple: apple slices, wheat crackers and peanut butter. Hubby and I went out for a quick afternoon diner date - he had lunch and I had a milkshake. I made green salads topped with the last of Monday's leftover steak and some Emmentaler cheese I had gotten on sale earlier in the week at Whole Foods. Very tasty. We were out of salad dressing, so I made some. Possibly one of the world's best comfort foods. Ground beef and Swiss chard simmered together in beer, then combined with gruyere cheese in a casserole topped with breadcrumbs and more cheese. Berries, yogurt and milk. Drinkable breakfast or snack. A slow-simmering pot of pinto beans, super-simple, made in the Mexican style. Eat them with tortillas as a light meal, or as a side. Or use them as a soup ingredients, or to make refried beans. The simplest way to prepare broccoli in the oven (with a huge flavor bang for your convenience buck).